Here are 10 brand new tech features you can find in modern cars and trucks. Automakers are constantly adding new tech features to cars, but it can be hard to stay on top of the news. These ten innovations in current (or soon to debut) cars and trucks provide a few extra safety and convenience benefits. They show that technology rarely stands still, especially if you are trying to merge onto the highway in your morning commute. This sedan is the first to support the latest smartphone integration services. You connect an Android phone or iPhone to the USB connection in the car. On the 8-inch touchscreen, Android Auto or Apple CarPlay kick in automatically and you can access the phone for music playback, navigation, and making calls. Kia also lets you access the functions by voice in the car. Trucks have historically been slow to adopt new tech features like lane-keeping. 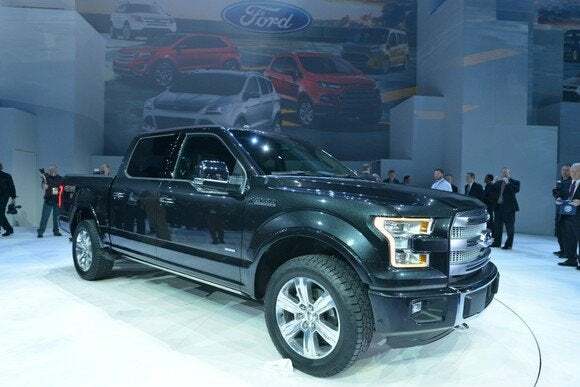 The F-150 not only warns you if you are leaving the lane (by pulsing on the steering wheel), but can slow down if you are taking a corner too fast -- dangerous in all conditions but especially while towing. The truck also knows if there is a taillight out in your trailer. Details are still a bit scarce, but the Augmented Vision tech for the Mini Cooper could be a game-changer. The glasses project an augmented reality display as you drive. You can see how far you need to go when backing into a parking spot. Arrows appear on the highway to show you where to turn. No details on how much it will cost or when it will be available. Jaguar has radically improved the touchscreen in the new XF luxury sedan. It now works more like an iPad. The 10.2-inch capacitive screen lets you swipe and make other gestures like pinch to zoom. You can add shortcuts to the most commonly used functions, and even change the desktop wallpaper. The screen uses a quad-core processor and has a solid state drive. Debutting this summer, the sporty-looking XC90 has a brand new tech feature not found in any other car. As you drive through an intersection, the car can look for a vehicle coming toward you in the opposing oncoming lane. If it looks like that car might try to turn in front of you or is heading for a collision with your front bumper, the car can brake automatically. BMW isn’t the only car company that lets you tap into your car with a smartwatch. The Blue Link smartwatch app, which works today with the 2015 Hyundai Genesis, lets you start the car, lock or unlock the doors, and even find the car in a crowded parking lot. The app works with most Android watches like the Moto 360; there will probably be an Apple Watch version. Many cars use sensors that looks for lane-markings and other vehicles. They can brake automatically or keep you centered in a lane. The Subaru Legacy uses a sensor called EyeSight that is mounted inside the windshield that looks for other cars and obstructions. It has more fidelity than most and won’t get obscured by snow or ice. It’s the only sensor the Insurance Institute for Highway Safety (IIHS) rated as “superior” in their tests. Having a 4G hotspot in your $40,000 truck is one thing -- you could probably spring for extra data connections on your devices. The 2015 Chevy Trax costs just over $20,000, so it makes more sense. Passengers can tap into the 4G signal. The service is free for three months or up to 3GB (whichever comes first). After that, fees start at just $5 per month. The upcoming 2016 Nissan Maxima, which should debut this year, has an interesting safety feature. (You may have seen it in much more expensive luxury models from Mercedes-Benz.) As you drive, the car monitors your steering patterns -- say, if you keep jutting to the left and right. A coffee cup appears in the display asking if you need a break and a chime reminds you to pay attention. An indicator shows your level of attention. Most all-wheel drive (AWD) systems engage only after the car senses tire slip. The 2016 Mazda CX-3 is the first to use a more intelligent sensing system. The car knows when road conditions might be icy, wet or snow-packed. For example, a built-in thermostat reads the temp. The car actively engages the AWD before any tire slip occurs.